Having a proper entryway into the house was on my "must have" list, but alas, we found a house that doesn't have an actual entryway, and instead you walk right into the house, but it works better than I thought it would. These are the only photos we have of this portion of the house in the little album of film photos we inherited with the house. It's obvious someone took on a wallpaper removal job - although at this point in the photos, they hadn't stripped the front door! I'm not sure if this is the original front door from 1959, but if I had to guess, I'd bet not. These two globe lights, however, might have been original to the house. 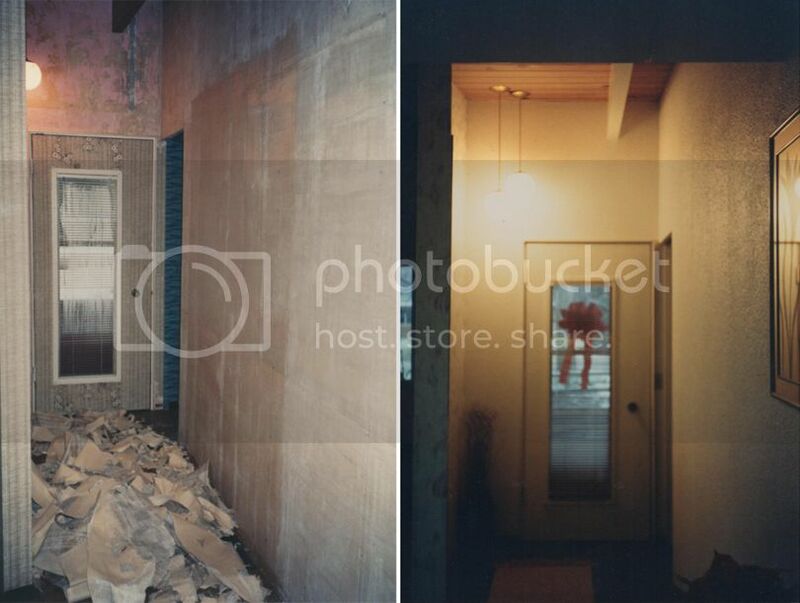 In both of these images you see the doorway to the right - that's the former half-bath, now a landing over the stairs. I don't have any film images of this room, but when we took it apart, we certainly found that blue grasscloth wallpaper on the walls under layers of paint. Here is the front door we purchased with the house - a lovely 15-lite door painted a tealish-blue. 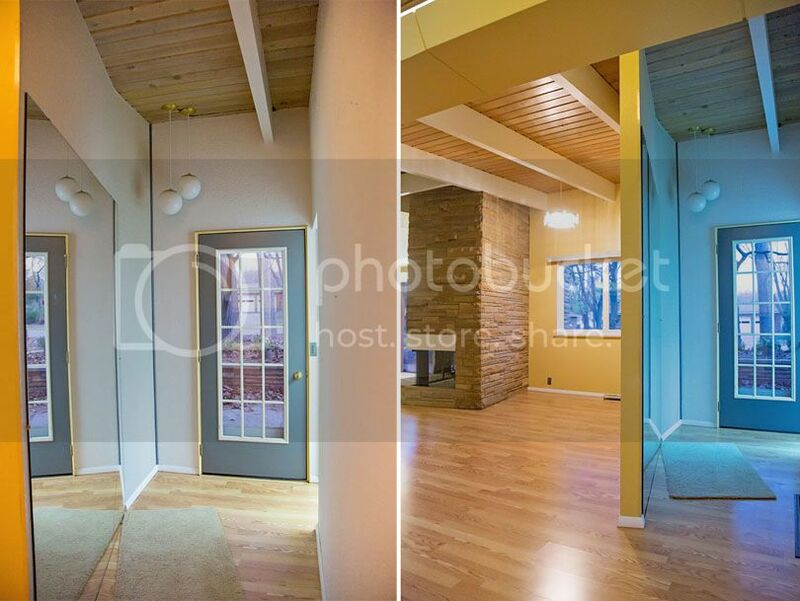 Notice the GIANT mirror on the wall in the left image - the original owner's sister told me she remembered that mirror, but thought it was in the dining room (on the other side of this wall), which makes sense, since where it is in this photo was added on at some point. 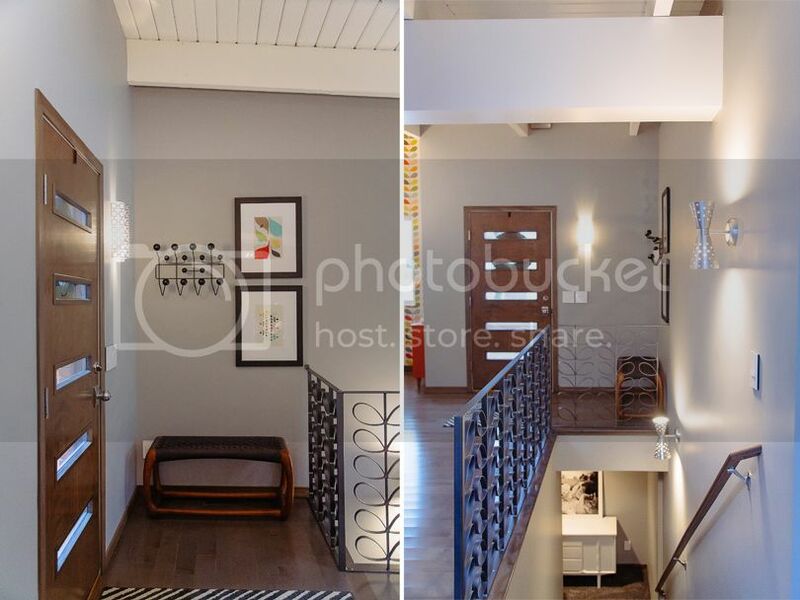 So, as you can see, there was more of a hallway when you entered the home. It felt too closed off for us, so we took it out. This is the half bath when you walked in the front door. I'm so bummed we don't have any original photos of this space - would have loved to see what the original colors were. I'd assume the cabinet was original, since it was built in to the wall. Not sure about the countertop. 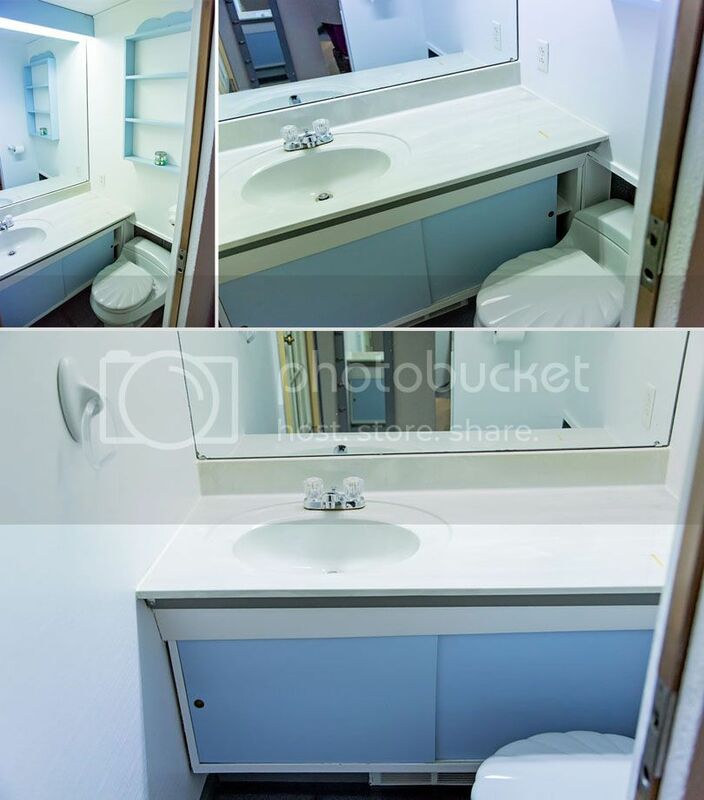 The room was so tiny, the toilet was recessed into the wall a bit - I would assume this was a replacement toilet, so maybe the original one did not do that. The grasscloth walls were still here - just painted over. 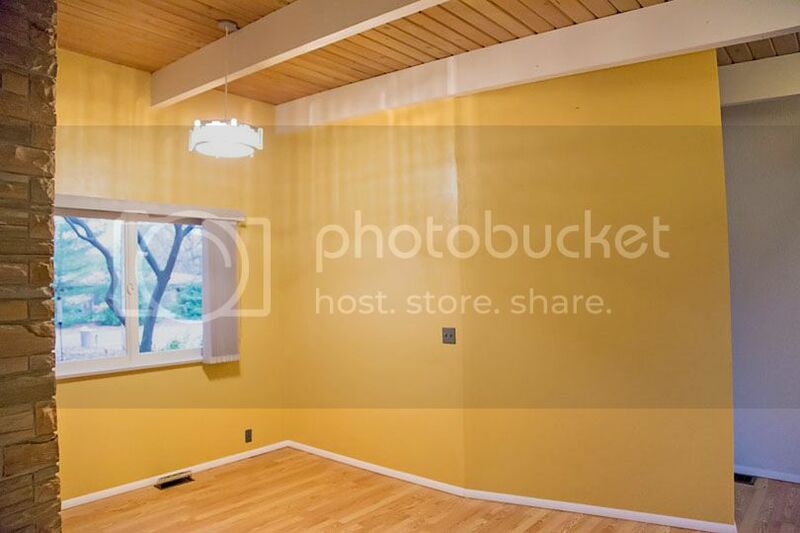 Something you don't see in photos is that the ceiling was dropped. When we took the bathroom apart, we got rid of the lowered ceiling, and in doing so, uncovered the original doorbell (non-working), a portion of unpainted beam (which was hidden in the ceiling) and the end of the I-beam that supports the garage (which Greg had to cut down, so the new drywall could lay flat). I shared this old film image in the dining room post, but here's what it looks like on the other side of the front door. Obviously they added this wall on at some point, and covered up the milk door. I believe this is the original dining room light. And here it is on closing day. Someone replaced the light. Bummer. 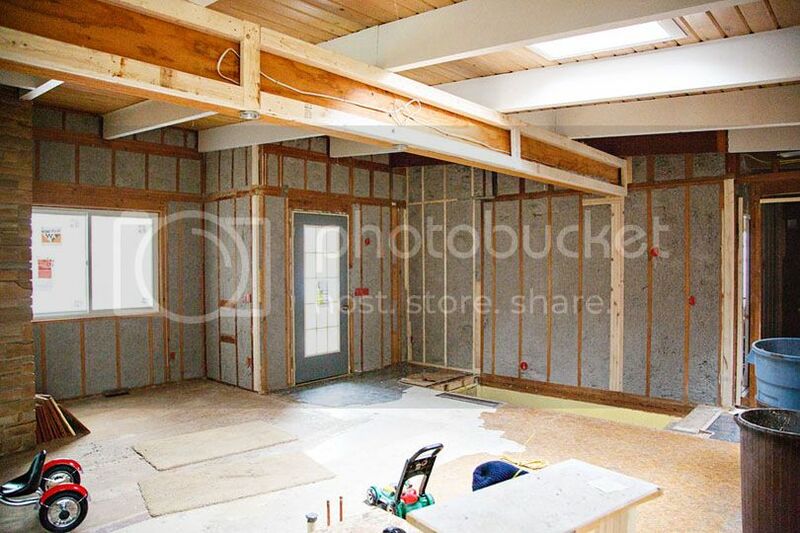 In the middle of our renovation, you can see we took everything to the studs and added insulation, since the house had none. You can see the various floors, how we took out the walls around the basement stairs, and you can kinda see where the toilet sat on the floor right above the stairs. So now, instead of a half bathroom, we have a little area where you can sit and take off your shoes, and hang your coat when you arrive. The former walls that surrounded the stairs, are now a railing (custom made by Greg, inspired by our Orla Kiely wallpaper that hangs nearby). The door has been replaced with a wood Crestview door, stained to match our trim, and we had new floors installed throughout the house - they are all the same now - no patchwork quilt floors! 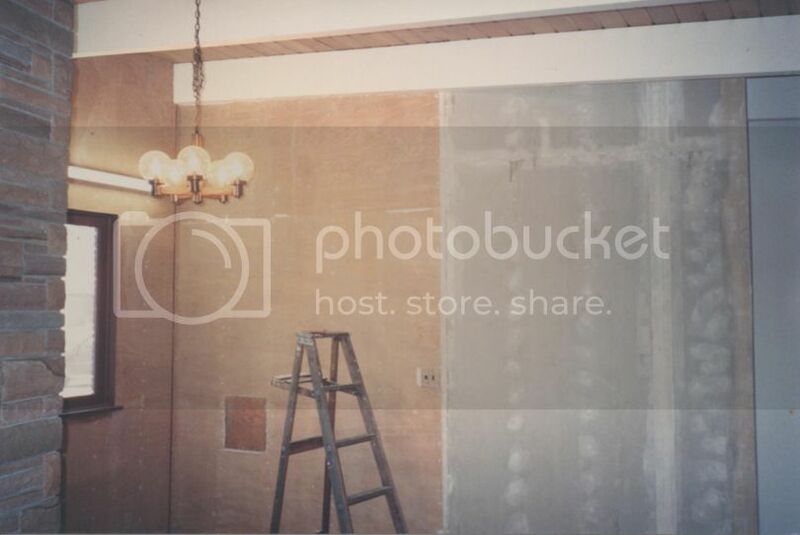 Another shot of the former half bath/basement stairway. Fascinating stuff, as usual! 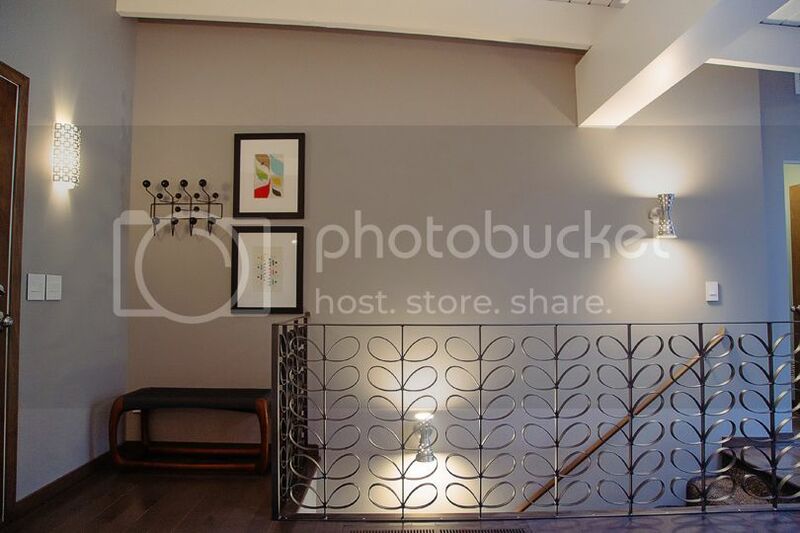 I do love your entrance, and the railing is SO impressive (we're Orla Kiely fans). Random question –do you use your Eames Hang it All? It looks great without anything on, and we're tempted to get one in white, for our entryway. It works for me as a piece of art, more than anything. Seeing yours 'naked' makes me think it could be acceptable to leave it that way! We use it all the time when we are wearing coats, and then it sits empty in warmer months. We have no coat closets in the entire house, so it's both form & function for us! Thanks! I'm glad it gets some use. I've only worn a coat a few times since we moved here from Boston, so it will probably be empty most of the time –I think we'll go ahead and get one though. They look so cool.